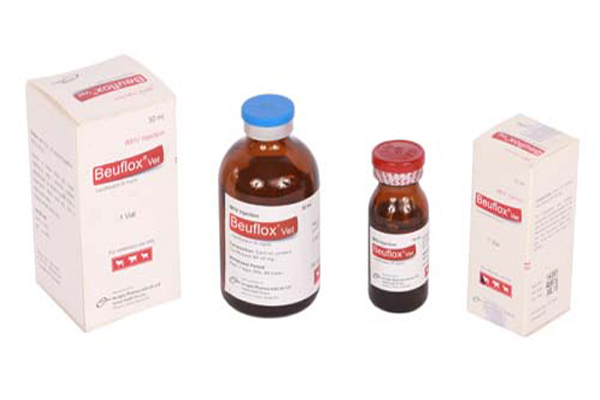 Beuflox Vet injection: Each ml contains Ciprofloxacin BP 50 mg.
Ciprofloxacin is a member of Fluroquinolone and which shows powerful bactericidal activity by inhibiting bacterial cell wall synthesis and DNA-gyrase which is responsible for supercoiling of DNA. It is a time tested broad spectrum antibiotic. Cattle, buffalo, calf, goat & sheep: For the treatment of digestive & respiratory tract infections caused by Actinobacillus, Pasteurella, Streptococcus, Bordetella and for the diarrhea caused by E.coli, Salmonella susceptible to Ciprofloxacin. It is also used in Enterotoxaemia, Skin, Bone & Ear infections, Anthrax, Uterine infections, Mastitis and Urinary tract infections. Cattle, buffalo, calf, goat & sheep: 1 ml/10 kg body weight or 5 mg/kg body weight twice daily for 3-5 days. This injection can be administered either by IM or by IV route. Ciprofloxacin is time tested and clinically well tolerated antibiotic. However, common reactions may be seen as Central Nervous System (CNS) toxicity, Gastrointestinal reactions, Hematuria, Hepatotoxicity, Hypersensitivity reactions and diarrhea. It should be used with caution in animal suspected or known CNS disorders. Intravenous doses of Ciprofloxacin of up to 20 mg/kg of body weight in pregnant rats and mice have not shown evidence of maternal toxicity, embryotoxicity or teratogenic effects. Ciprofloxacin can be distributed into milk, sometimes at a higher concentration than in plasma, but it is not known under which conditions it occurs.